who will experience anxiety and the fear of failure more than they feel the joy of learning." Pupils of every age are under pressure to learn things for which they are not ready, leading to shallow learning for the test and children developing a sense of ‘failure’ at a younger and younger age. ​Where you ought to be"
ATL Blog - Why are so many kids so unhappy at school? ​We need to listen more carefully to young people and to provide an education system which inculcates a life long joy of learning, rather than an exam treadmill. The present exam system is unsustainable, and will become more so. Things will change eventually – but enormous damage will have been done in the meantime. In a new international study of children’s well-being, children in England ranked 14th out of 15 countries for satisfaction with life as a whole. 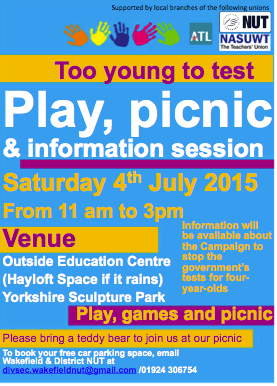 Birmingham NUT- There will be a 'Too Young to Test' picnic in Cannon Hill Park on Saturday 27 June. Barking & Dagenham NUT- As part of the borough's Play Days on Wednesday 29 July there will be a story telling and play event in Mayesbrook Park in Dagenham. 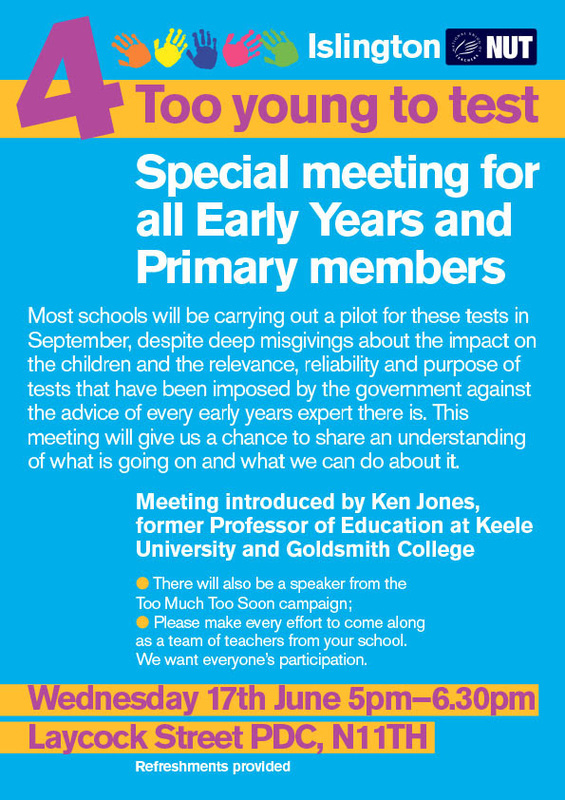 The event will also be providing parents with information on baseline testing and the campaign against it. 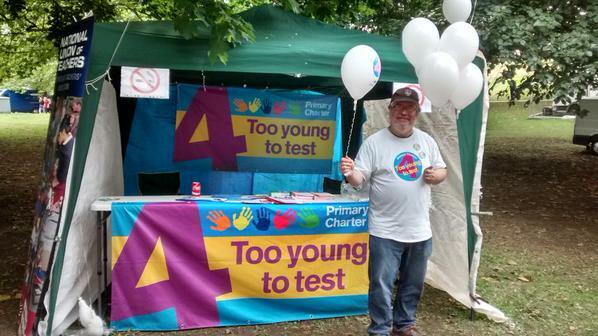 East London NUT- Michael Rosen was guest speaker at a National Children’s Day picnic and play event. 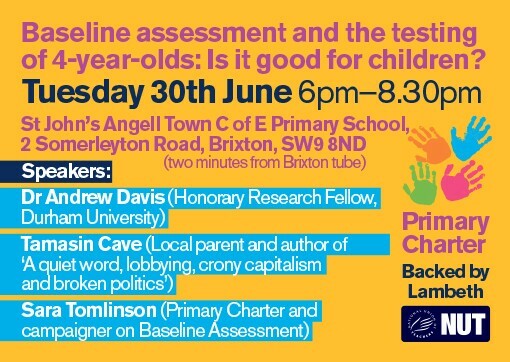 You can watch a video of his speech on baseline testing here. Sheffield NUT- A parents’ Facebook group has been set up to keep parents and teachers informed of the local campaign. Thanet NUT- Campaign stalls have been held, including at a rally to commemorate the Miners strikes in Kent. Nottingham NUT- Nottingham have held stalls, produced local leaflets, held a National Children’s Day picnic and collected email addresses to notify people of future events and activities. They have also set up a parents Facebook group for their local campaign. 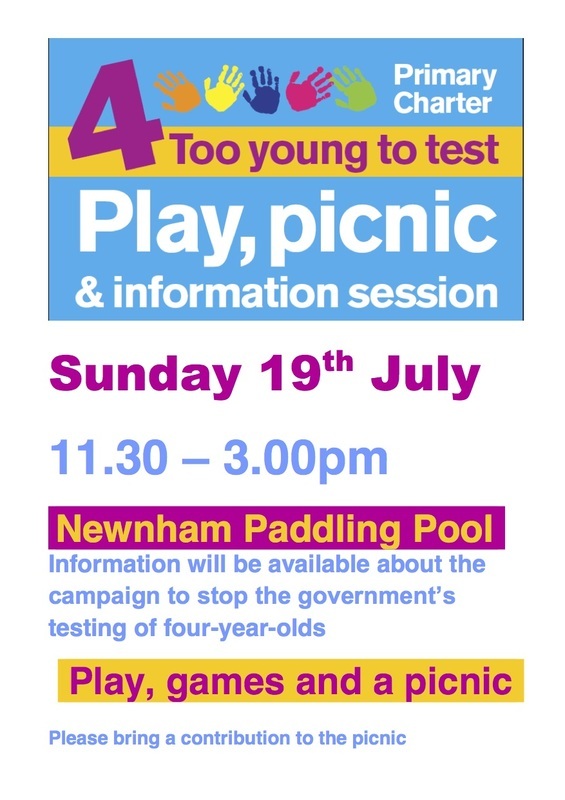 Cambridge NUT- Cambridge held a picnic and play session on national children’s day to show why four is too young to test. 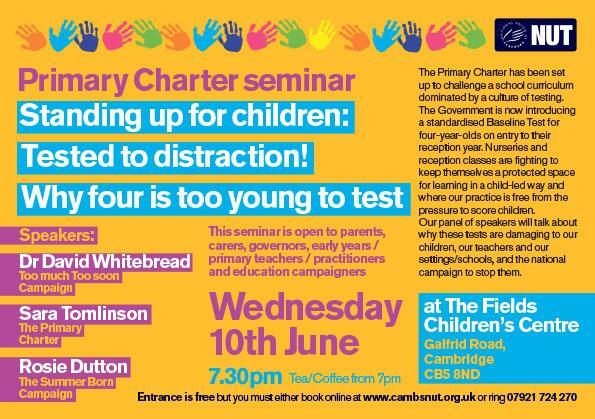 They also hosted a seminar with David Whitebread, a speaker from the Primary Charter and the Summer Born Campaign, on June 10. They are using guest speakers to make links with local radio to help spread the campaign to the wider public and engage new supporters. Lambeth NUT Lambeth have held stalls in the local community to speak to the public about why children are better without baseline.